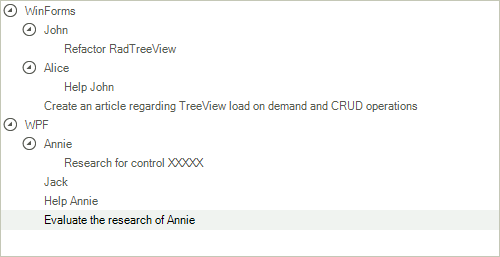 If you have a complex hierarchy, which includes business objects of different types, some of them have children and some do not, and you need to visualize it using RadTreeView while keeping the CRUD operations, then this article is for you. In this example, we will use the following scenario: A hierarchy, which has Teams, each Team has TeamMembers and Tasks, and each TeamMember has his own Tasks. Every Team, TeamMember and Task have names which will be displayed in the RadTreeView. 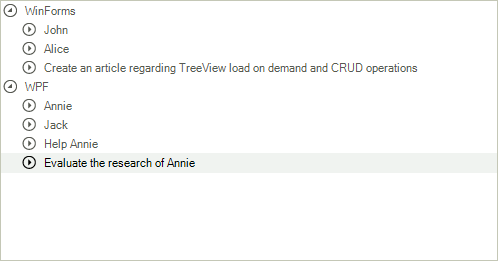 You see at the bottom that we are adding the Teams to the Nodes collection of the RadTreeView. They will be our base and when expanded we will load their children. If you run the application now, you will notice that the nodes are loading their children, however there is something which we do not really like. We know that the Tasks do not have any children, yet, they have expanders in front of them. We can easily correct that by using the NodeFormatting event. In the event handler we simply check if the node’s Tag is a Task and if it is TeamMember, whether it has any Tasks, and if it is a Team, whether it has any TeamMembers or Tasks and hide the expander appropriately. And to handle the case where something is modified in the data source, we will need to subscribe to the ListChanged event of the BindingList and rebuild the RadTreeView by clearing the nodes and re-adding the first level nodes. You can optionally save the expanded node’s state as per this article.